So, the May scrapbooking promotion was the kick in the pants I needed to commit to getting the rough type alphabet stamp set. I loved the idea of a high quality clear mount alphabet but was initially on the fence. Well, the incentive of free designer brads was enough for me to just go for it and boy am I glad I did! Sure, it takes a little bit to label all of the stamps but once you do, it is so easy and fun to make all kinds of words. In this case, I was playing and decided to spell out Love. It also gave me a good excuse to play with my BigShot – both with the polka dot impression folder and my heart die. A few weeks back, the Royal Blog Tour kicked off with a huge number of blogs sharing some fantastic projects. While I was browsing, I entered my name into a few blog candy drawings and much to my excitement, I actually won one! The lovely Peggy Outen had some fabulous projects and sent me the Chit Chat rubons from the Occasion Mini that retired at the end of April. Now, little did she know how much I LOVE rub-ons. They are like clear stamps without the smudging. I love that I can place them anywhere on the page, see exactly what it will look like before commiting it to paper, and then armed only with a popsicle stick, can get a perfect image in seconds flat. Yes, Peggy, you are the very best ever. Thanks for being so generous and sending me the rub-ons. I also had to use some of my goodies from the clearance rack. So, the curly label punch out is the Canvas Cuts with the matching Fashion District rub-ons. Using the Canvas Cuts has been a lot of fun and so much easier than I expected. I was in such a groove, I had to make one more using the Canvas Cuts and the Chit Chat rub-ons for the sentiment. 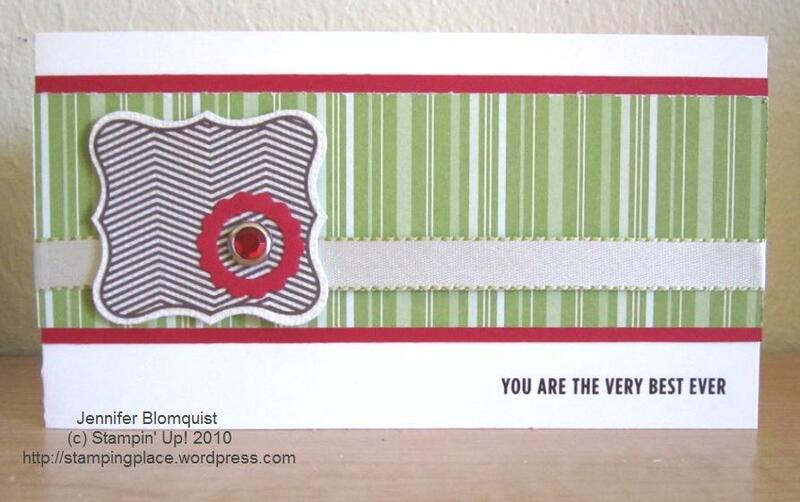 This card introduces another super fun product – Bitty Buttons and the matching Itty Bitty Shapes punches. 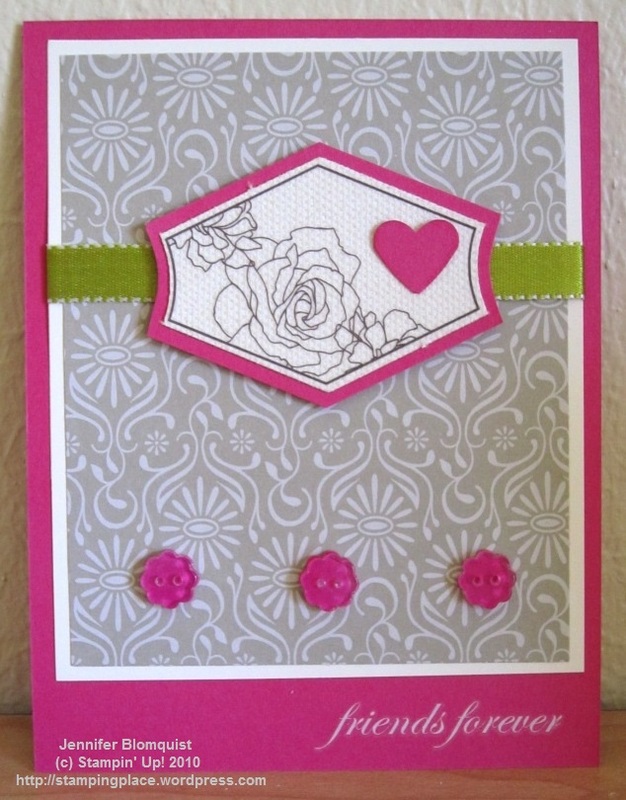 I thought the little flower buttons and punches went great with the DSP, and they look sooo cute in person. I think this may be my favorite Summer Mini catalog item. I just saw that Stampin’ Up! has added even more fabulous retired items to the online clearance rack. Some of these items are such amazing deals at up to 60% off that I had to quickly share them with you. Check out all the great deals online. I’ll be back again soon with more project shares but had to spread the word of these great deals. Hurry and get your favorites before they are sold out! See it all online in the Clearance Rack. Well, May is here and that means that the new Summer Mini has been released. Boy is it a doozy this time! With something for everyone, there are great products for scrapbooking, vintage, new punches, awesome new accessories, papers, stamps and more. As a bit of a punch junkie, one of the items I had to order was the new Itty Bitty Shapes punch pack. That’s right, punch PACK… where you get three small punch shapes that not only coordinate with a stamp set but also with some new clear Bitty Buttons. How cool is that?!? I’ll be pulling those out to play with this week. So, while I’m working on some samples to share with you all, I wanted to also share some cool promotions going on this month. Free brads – Celebrate National Scrapbooking month! Love fun brads to accessories your scrapbooking and card projects? Well, for the month of May, purchase select stamp sets and receive a FREE package of designer brads. Check out the flyer for all the details. Free stamps and more – Ever thought of starting your own business or just having access to tools, ideas, and a great discount for your own crafting hobby? Well, Stampin’ Up! may be the perfect opportunity for you. With such a supportive community, lots of awesome resources to learn new tips, tricks, and ideas, and a chance to not only earn 20% of everything you buy or sell but to grow your love into a fun home business. I love being a Stampin’ Up! demonstrator and would love to answer any questions you have about if it is the right thing for you. If you are ready to join the Stampin’ Up family, sign up through my online website (passcode is “stampingplace”) or contact me to get started. Right now, not only is Stampin’ Up going to send you two awesome Workshop WOW DVDs with great ideas and techniques but I’m going to sweeten the deal a little. As I mentioned above, during May, when you purchase certain stamp sets you get FREE brads. Well, sign up to join my Stampin’ Up! team this month and I’ll GIVE you your stamp set for FREE as well. If you have any questions, don’t hesitate to contact me!